Actors: Dharmendra Hema Malini Ajit Nasir Hussain Johnny Walker Jagdeep Keshto Mukherjee Sunder D.K. Sapru Maruti Imtiaz Abhi Bhattacharya Satyendra Kapoor Brahmachari Alka Ram Mohan Mehar Mittal Shree Bhagwan Urmila Bhatt Birbal V.
Description: Ajit Singh (Dharmendra) learns that his parents and younger sibling's death was due to a ruthless bandit massacring them in cold blood. Taking an oath that he will get revenge Ajit Singh ventures out to find the bandit Bharat Thakur (Ajit). However being wanted by the police for accidentally stealing goods Ajit goes into hiding and ends up witnessing a bloodbath shoot-out between the bandits and the police. The police were on their way to set up a police station in the rural town of which Bharat Thakur has control under in order to bring law and order for the people there. However Bharat has come to know of this plan and as a result all the policemen die in the shoot-out. 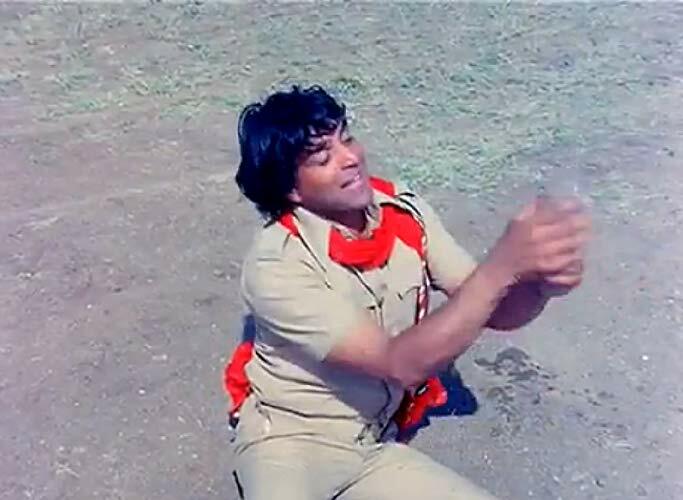 After seeing this Ajit decides to pretend to be a policeman and carry out their mission. When he arrives at the village all he finds are village people who are too scared to face the bandits. Ajit Singh now faces the task of training them up in order to make his mission work - will he ever fulfill his 'pratiggya' against Bharat?Ajit Singh (Dharmendra) learns that his parents and younger sibling's death was due to a ruthless bandit massacring them in cold blood. Taking an oath that he will get revenge Ajit Singh ventures out to find the bandit Bharat Thakur (Ajit). However being wanted by the police for accidentally stealing goods Ajit goes into hiding and ends up witnessing a bloodbath shoot-out between the bandits and the police. The police were on their way to set up a police station in the rural town of which Bharat Thakur has control under in order to bring law and order for the people there. However Bharat has come to know of this plan and as a result all the policemen die in the shoot-out. After seeing this Ajit decides to pretend to be a policeman and carry out their mission. When he arrives at the village all he finds are village people who are too scared to face the bandits. Ajit Singh now faces the task of training them up in order to make his mission work - will he ever fulfill his 'pratiggya' against Bharat?